Many people are surprised to know that asphalt, the material used to pave driveways and highways and even make roofing shingles throughout Palm Beach County is a product of the petroleum industry. So reliable, cost-effective and versatile is asphalt that it is used to pave 93 percent of American roads including I-95, Glades Road in Boca and Okeechobee Blvd. in West Palm Beach and Atlantic Ave. in Delray Beach to name a few local roadways. Asphalt also makes for driveways that are both beautiful and velvety smooth to drive on. A well-cared for asphalt driveway can last from 12 to 20 years. But what is the best way to take care of it? The heat of the Palm Beach sun can cause the surface of the driveway to dry out, and its ultraviolet rays can cause it to turn dull and gray. After enough exposure, hairline cracks develop. These driveway cracks need to be seen to as soon as possible, for they only get bigger and uglier over time. Not only that, tough weeds take advantage of the cracks and begin to grow up through them. This makes them even wider, which then allows water to seep into them and ruin the sub-base. Eventually, a pothole develops. A new asphalt driveway that was properly installed at your Palm Beach County home won’t need to be sealed again for about a year and should be sealed every three years or so after that. But one way to treat a driveway with only a few cracks is to reseal it. Sealing not only removes the cracks and makes a dull-looking driveway look almost new but protects it from the oils and other fluids that come from the vehicles and water that can erode the sub-base. Sealer can be bought in five gallon cans, which will do for about 250 square feet of driveway. Older driveways will need more sealer than newer ones. It’s also important to apply the sealer on a dry day, for rain will wash it away. The worker should put on old clothes that they won’t mind getting dirty, for sealer is tar or asphalt-based. 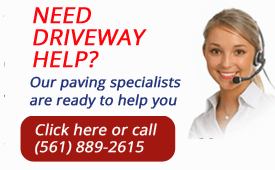 The asphalt driveway must be thoroughly cleaned and all potholes and large cracks filled before any sealer is applied. Potholes can be repaired with cold patch, a blend of aggregate and asphalt. Treat larger cracks with an asphalt based-caulk delivered through a caulk gun, and cover smaller ones with asphalt roll. After the driveway has been repaired, it should be washed with the garden hose or even a pressure washer. Then, a cleanser should be used to remove tough stains. Finally, after the driveway is dry, the sealer should be applied with a squeegee or an old push broom. Experts recommend applying two thin coats of sealer with a gap of 36 hours between applications for the best results. Then, let both coats cure for another 48 hours. Resurfacing is a more intensive procedure than sealing. A homeowner can know that their driveway needs resurfacing if they pour a bucket of water on it on a hot day. If the water soaks in, it’s time to call our professionals at Trinity Asphalt Paving for resurfacing. For more information, don’t hesitate to contact us.